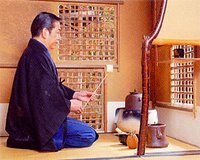 "Finding coolness (ryoo o mitsukeru 涼を見つける)"
in the tea ceremony during summer. The head of the Urasenke Tea Ceremony, Sen Soshitsu (Sen Sooshitsu)　裏千家の家元、千宗室, talked about ways to stage the coolness, for example using a large fresh green leaf as cover of the water container (habuta　葉蓋) or wringing the little linen cleansing cloth in a way it produces the fresh sound of clear water (arai jakin 洗い茶巾). The intention is to create an aesthetically cool feeling, not to physically cool anything. Using fresh water from one of the many famous wells in Kyoto (meisuidate　名水点) was also enjoyed in summer. After a sip of clear cool water, thick tea (koicha　濃茶) was served to the guests. The water from the well was carried to the tea house in a special square cedar box (tsurube mizusashi つるべ水差し), purified by a rope with white Shinto paper strips (shimenawa　注連縄). During the old times without airconditioning, people had to live with the seasons as they where and try to enjoy them as best as they could. Choosing a tea cake with a name to provoke coolness is also important. Most of them have a transparent look and are served on a light dish, often made from glas to also evoke a feeling of LIGHT when you pick it up. For example, "water peony", mizubotan　水牡丹, made from red bean paste and kuzu starch. There are many kigo evoking the coolness during the hot summer of Japan. Let us examine some of them. In Autumn, when it gets really cool, there are other kigo with the word "coolness" to express this feeling, see below. It refers to a cool evening (tsuki suzushi 月涼し). hanagoori 花氷 (はなごおり) "ice flowers"
Flowers of the season are put in a cube of ice or an ice pillar and then decorated on the table to stage the feeling of "coolness" at the tea ceremony or expensive restaurants. Mostly in the evening of a hot summer day. They are sometimes erected above or near a river and you can eat and drink there. suzumibune 納涼舟（すずみぶね）boat to enjoy a cool evening breeze . . . CLICK here for Photos ! 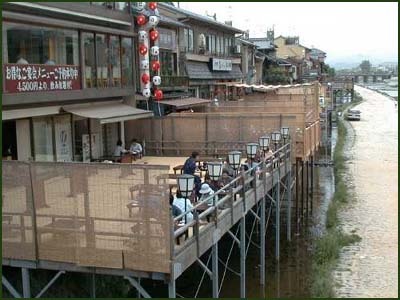 also called kawadoko, dining decks on the river Kamogawa in Shijoo, Kyoto. In Kyoto, near shrine Kibune Jinja (Kifune Junja) 貴船神社 served in the forest restaurants along the clean river. Another device to make us feel cool. Their sound is making us feel a cool breeze. The 20th century will go down in history as having been a century of war, as well as a century of momentous scientific developments. I believe that the 21st century should be made into a century distinguished by mankind's care for the global environment, as well as by the importance people place on culture. 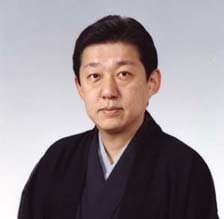 The Urasenke Homepage contains a wealth of information for those who seek knowledge about the various aspects of chado. I sincerely hope that each visitor will find something of value in this internet site, and that the ethos of chado, the value it places on pure-hearted interchange between fellow human beings, is conveyed. 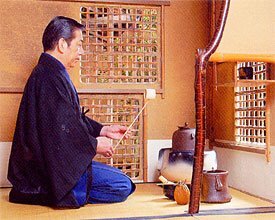 "Chanoyu: an Anthropological Approach to Tea,"
Kobayashi Issa has more than 50 haiku about the coolness.
. suzushisa ya kane o hanaruru kane no koe . "Kashikoki hito" is a man of high rank, or a nobleman. "Kachi watari" is to wade a stream. The refreshing cool I enjoy. Kindergardens and other clubs often have a summer festival in the evening called yuuzuzumi.
. uri tsukuru kimi ga are na to yuusuzumi . "They call it 'taking the night air at Fourth Avenue, Riverside': people lining up their stands in the riverbed from moonrise early in the Sixth Month, on until the dawn moon of mid-month--drinking sake the night long, eating, and partying. The women bind themselves with the showiest sashes; the men deck themselves out in long jackets. And there in the throng are priests and old people too--and even apprentices to coopers and smiths, all looking smug and at ease, singing and reveling. Now, that's life in the capital! " Written in 元禄3年6月, Basho age 47.
. . . CLICK here for Photos of usugaki kimono colors !
. Matsuo Basho in Kyoto . ..... hatsu ryoo　初涼 "first cool"
The seventh month of the asian lunar calendar. (Now August). This haiku does not appear in the authoritative collection of Issa, Issa zenshuu. I found it in Issa to kuhi (Tokyo: Kankohkai 2003) 53. It appears engraved in a haiku stone. Senryoo represents a highly valued thing, literally, something that costs one thousand ryoo, a coin of Old Japan. I was tempted to translate, senryoo ame, "million-dollar rain," but decided that this sounds a bit too modern. I went with "precious," but Issa's original is more hyperbolical, more specific. Forever in your dept, dear Gabi sama. This summer hokku is from 6/12 (July 13) in 1810, when Issa was living in Edo. The date indicates that the rainy season has recently ended and what is usually the hottest part of the summer has now arrived. This is what Issa's diary for 1810 also indicates. On this night Issa stayed at the house of his fellow haijin Sakurai Shou-u （蕉雨）, so he must be standing outside the door of the house or perhaps near the gate, if the house is set back and has a gate by the street, in order to catch a little cool air. It looks and feels as if tomorrow will be another equally hot, humid day, and the hokku seems to express acceptance of the fact that the "dog days" of summer are here to stay for a while. The best way to beat the heat for Issa was apparently travel. The next day he and Shou-u went on a short boat trip east of Edo, enjoying the morning cool on a river. They eventually reached the Tone River, where temperatures must have been a little more bearable. People came here in summer to feel the cool, have a snack and relax. This was called taki ami 滝浴み.